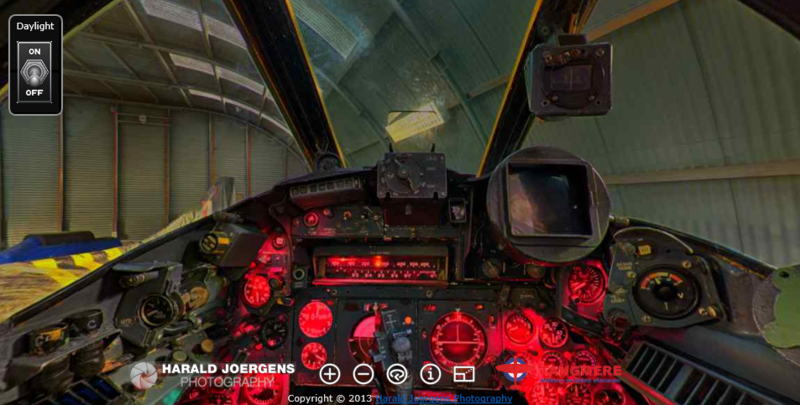 For a client, the highly recommended Tangmere Military Aviation Museum near Chichester, I have created a high resolution interactive cockpit panorama of their English Electric Lightning F.53, ZF578. The panorama has two parts - a daylight view, and a night view, with the cockpit light for the instruments switched on. Please use the "virtual switch" on the top left to toggle daylight! In the daylight panorama, all controls, instruments, and switches are explained. Unfortunately, this does not work on touchscreen devices. The panorama was shot inside a museum's hangar, using only available light. Surprisingly rugged and old fashioned today. Like a WW2 era aircraft. 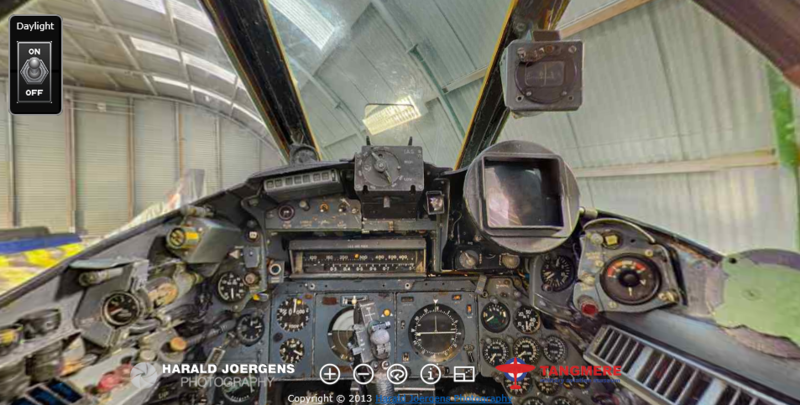 Don't miss the panorama of the B-36. B-36 panorama? Where could I find that? Found it, thanks! Very impressive! I'm hoping that I can do a similar thing for a Concorde this year. Yeah it's pretty neat alright. How are all the instruments? Did you watch the SAC video with Jimmy Stewart? All the instruments are nice and clear, the panorama has a really good resolution. Yes, I've seen the video, the B-36 is really a very impressive beast! Look one more time mate. I added in a video on weapons systems and other details. Phenomenal! What a shame such technology was so short lived. The jet bomber saw to that. I had indeed missed that, WOW! That's really impressive! Thanks!! !